I have cancelled my subscription. What follows is the record of a good app gone bad. Original review: I have not encountered the authorization problem others report. The app is working fine for me. While I am sure that something could be added to it, I am quite happy with it as it is. It combines simplicity with function in a fashion that can only be described as elegant. The layout results in a degree of readability I have seen in no other iPad app. I just wish it were independent of Apple's Newsstand, so I could keep it right on top of my iPad home page. Update May 16, 2015: I have reduced my rating for this app. In both this and the previous version, the reader could select specific articles from the current and previous issues, to be saved and read later. But the previous version provided a table of contents for bookmarked articles. All the reader had to do was scroll down the list and tap on the article he wanted to read. The new version presents a carousel which requires the reader to swipe through every page of each of the saved articles until he gets to the article he wants to read. This is tedious. It might make some sense if each item on the carousel represented a new article, but the carousel displays every page of each article. Suddenly, a list of 20 saved articles has turned into a carousel of 200 pages, with no hint of the location of the article the reader wants to read, assuming he remembers saving it. Further, articles saved under the old version are in the carousel but do not refresh - that is, you see the title and a blank page. So a previously well functioning bookmark feature has been downgraded significantly. Further update May 20: Reduced my rating again. Since the Scrapbook function has been made less useful, I decided to resort to sending articles to Instapaper. 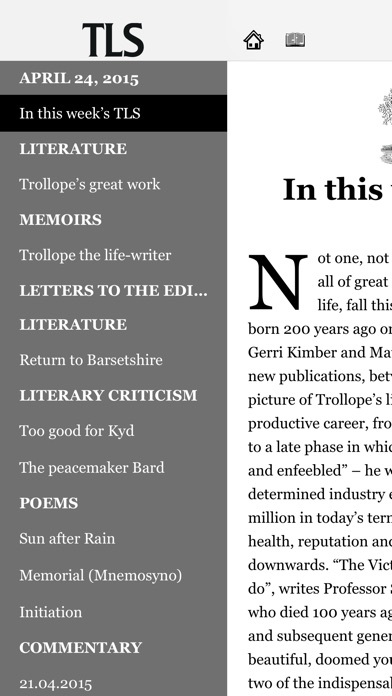 Oddly, the Instapaper option does not appear in all issues of the magazine. But it doesn't matter because it turns out that this functionality, which existed in the previous version, no longer works. In addition, I had downgraded to the previous TLS app so that I could get rid of the carousel, but downloading the current issue seems to have put me back on the current version of the app. Further update June 19, 2015: I have emailed Support with my complaints and received not even an acknowledgement. There goes another star. Almost impossible to access one's own paid subscription. This app is continually denying me access to new issues; the digital subscription has been a complete waste of money. Every time a new issue comes out the app forgets who I am and I have to sign in again. Deleting and reinstalling app doesn't seem to help. Dearth of documentation in Settings. E.g., no directions for deleting issues. Also, no indication that American subscription numbers have an extra digit so that, when signing on, you should only type in the first seven. TLS cyber efforts have always been dicey, and this is no exception. The generally excellent content is let down by the poor functionality of the app. Everyone seems to agree. Why not just get on and fix it? This is an update to a previous review: they have fixed the technical problems and everything works well so I am giving it four stars. Why four? 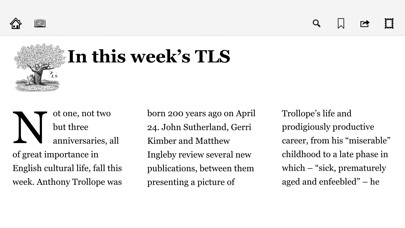 Simple--it just isn't as interesting to read as the TLS on paper, less satisfying because not as easy to browse. On the other hand, immediate access to the longer excerpts that appear in the print edition. So I am a very happy customer overall. Would give it 4.5 if I could. Earlier review: I really want this app to work. The few times it has, 5 stars. The multiple no times, no stars. No download authorized, I am told (though my subscription is active). Can't be removed from my device (why?). I called customer service on this and they said that there have been problems since March which were supposed to be fixed end of June (this is July). I heard back on an e-mail sent over a week ago saying things would be dealt with soon. Hmmm... Okay, I have been credited for an extra four weeks on my subscription, thank you, but what I really want is to be reading! Yes, you can sometimes (hit or miss) download by reinstalling the app, but the operative word here is sometimes. 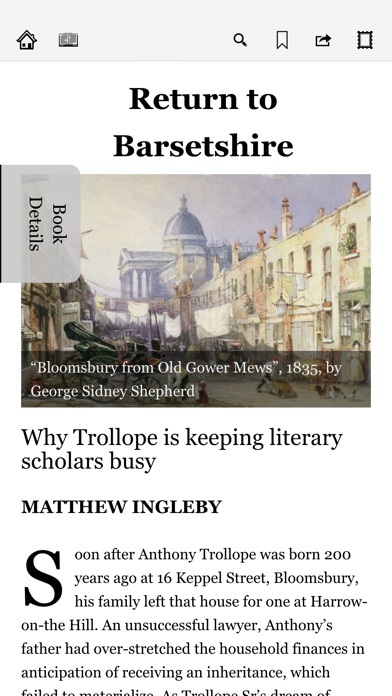 The TLS App is awful. 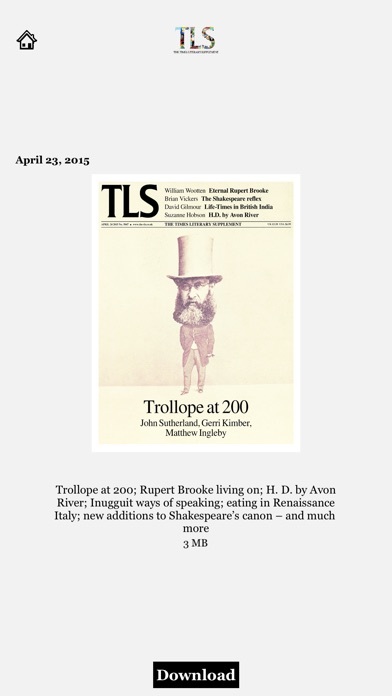 TLS magazine is superb, but the TLS app is awful. I am not the first to complain it; many subscribers have complained about it. However, TLS management refuses to acknowledge it, and has no interest in fixing it. This is very surprising and consumer unfriendly. The management needs to wake up. Worst digital subscription app I have had the sad occasion to pay for using. Can’t remember my subscription information and provides no means to sign in to one’s account. Open the account tab and you are informed you are not authorized to view YOUR account information. All past issues locked for access by digital subscribers only, though you are and for several years have been a suffering digital subscriber. Sometimes the app remembers who you are and lets you in. Other times it does not and since it doesn’t allow you to sign in (how elementary a convenience!) you must again send an email to find out how to get in—when you want to read an issue now, not three days hence. This has been going on for 3 years and no web site improvements in that time. Tossing the app and keeping the print edition. On new monthly plan and can't discern how to log in. Why can't my account number be retained like Every Other subscription app I use? 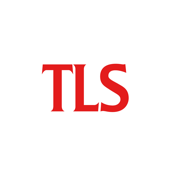 The TLS app is unstable, unpredictable, and maddening most days. Occasionally it will work without a lot of pampering and pleading, if the TLS wasn't so important to me I would not use it. Subscriber via iTunes since 2014 but no issues in 2016 are available to download. TLS is unresponsive, and meanwhile they've stolen $9.99 per month from me. What's the problem? Great when it works. Usually, however, one must uninstall and reinstall every time. A pain with slow internet. Consider resolving technical issues out of respect for loyal subscribers. How many times do I need to contact technical support with complaints about sign in issues before you fix the problem? Regretting subscribing to 'the works'. You guys are a-holes. They updated the app to use in app purchases and now I can't access my current subscription that I already paid for last year. In order to read the latest versions they want me to pay again even though my subscription is still active. Pathetic app where the tech team constantly screws things up. Loved this until it stopped downloading because of 'authentication service' problem which they are either unable or unwilling to fix. Customer service is not helpful, just says they are working on it. Really, for 3 weeks!? I am about to cancel the whole thing and ask for a refund. I have to re enter my subscriber number every time I log on, which send me running for a paper copy to find that number, which makes me wonder why I have an electronic version at all! It wont let you share articles. And why those fusty little windows you have to click on to know what book is being reviewed? Why do I keep having to log in with my subscription information with every single new issue? It's a nuisance that the app doesn't remember it. I, too, have it. Customer service gave me a voucher number, but that wasn't the problem. They haven't responded to me since I reported that the problem was ongoing. Glad to know others have it; not glad that I can't read the digital version of the paper. 1) Too high a ratio of trivia to important matters; 2) Too many articles by second-rate leftist academics; 3) Too often I have to sign in again despite having a continuing subscription; 4) Can't share articles or even excerpts with spouse or friends; 5) Unhelpful table of contents makes finding an article again or previewing an issue's content nearly impossible. Email support, however, is outstanding, on issues other than the above. If you can't offer a working app to your subscribers, go back to the drawing board. Requires a password change every login and still doesn't work. An embarrassment for a venerable publication.